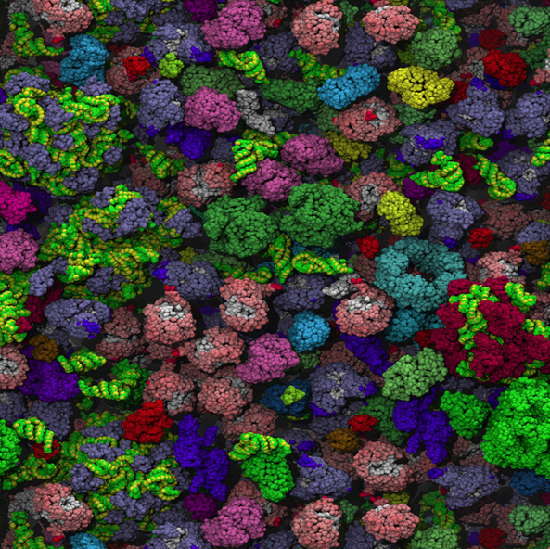 A very striking image features on the cover of the March 2010 of PLoS Computational Biology (below), showing a molecular simulation of the interior of the cytoplasm of the bacterium Escherichia coli. Source: PLoS Computational Biology; image credits: Elcock, University of Iowa. One of the things that has impressed me as important to understand molecular biology is a need to understand how molecules work within the very dense of the interior of a cell. ’Test tube’ studies of molecules–properly termed in vitro studies (literally, in glass) as opposed to in vivo studies (literally, in life)–are usually in very different conditions to the crowded conditions found in the interior of the cell the molecules being studied came from. The research associated with this figure reports one of a small number of attempts to examine the impact of crowding effects inside the cells on the behaviour of proteins. The authors based their model on the 50 most common molecules found in the cytoplasm of E. coli. The molecules in a mixture of green and yellow are RNAs (ribonucleic acid), the others are proteins. They show that their model matches reasonably well with in vivo measurements of the diffusion rate of a fluorescent ’marker’ protein (the popular cell biologists‘ work horse GFP, green fluorescent protein, which won the 2008 Nobel Prize for Chemistry). Likewise, the thermodynamic stabilities of the protein studied are comparable. This work points to a promising future of detailed molecular simulations of large collections of molecules aimed at understanding the behaviour of molecules in these conditions. McGuffee and Elcock, PLoS Computational Biology 6(3)694 (2010). Bioinformatics — computing with biotechnology and molecular biology data.